Every person has faced a leader. We hope that all of our teachers and bosses are fair and upright. But, there is a good possibility that one day we will have a leader who is cruel and unfair. We would be wise to learn from the examples of the prophets before us – what to do and what not to do. How should we respond to a cruel leader? For years David was forced to flee because King Saul desired to kill him. But in one instance, Saul entered a cave without knowing David was already hiding inside. After Saul had left, David said to him, “Some urged me to kill you, but I spared you; I said, ‘I will not lay my hand on my lord, because he is the Lord’s anointed.’. . . I cut off the corner of your robe but did not kill you . . . I have not wronged you” (Torah, 1 Samuel 24:10-12). David respected Saul because he knew that all leaders are anointed by Allah, even Saul who tried to kill him. David knew that Allah was the judge, not man. Early on, Muhammad was respectful of leaders. However, when the leaders of the surrounding tribes opposed him, he began conquering them. Some leaders were enslaved while others were killed. For example, Muhammad sent some people to kill Abu Rafi’, a leader of a Jewish tribe (Sahih Bukhari 5:59:371). Please send us your thoughts on Muhammad’s actions. Isa Al-Masih also faced cruel and unjust leaders. 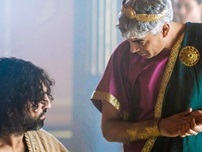 Several days before Isa died, he was captured and brought to the high priest’s house. Then, “The men who were guarding Jesus [Isa] began mocking and beating him. They blindfolded him and demanded, ‘Prophesy! Who hit you?’ And they said many other insulting things to him” (Injil, Luke 22:63-65). Later Isa faced Herod, who was ruthless. Herod, “. . . questioned him [Isa] at some length, but he made no answer. The chief priests and the scribes stood by, vehemently accusing him. And Herod with his soldiers treated him with contempt and mocked him . . .” (Injil, Luke 23:9-11). Isa Al-Masih never defended himself even after having never committed a single sin. Isa even loved his enemies so much that He asked Allah to forgive their sins. “. . . Father, forgive them, for they know not what they do” (Injil, Luke 23:34). Not only did Isa speak with compassion, but he also showed his love by bearing the sins of every person who believes in Him, even his enemies. Please email us if you want to be cleansed from your sins forever. The best way to respond to a cruel leader is to follow Isa’s example by praying for them and forgiving them. This is the way to see more peace and to show love in the world. How does Muhammad’s response to cruel leaders compare to that of other prophets? Did his response create peace? Please explain! Do you agree with how David responded to Saul? Or would it have been better for David to kill Saul so that he wouldn’t have to continue running and living in fear? Why? s Isa Al-Masih the best example for us to follow when responding to cruel leaders? Why or why not? We encourage our readers to comment on the article above. Comments that don’t directly relate to the topic will be removed.